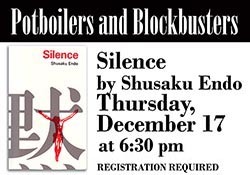 Join us on the third Thursday of the month at 6:30 p.m. to discuss Shusaku Endo's Silence. Please either have read the book or listened to the audiobook. Pre-register by calling the library at 732-4274.